The following soccer programs are run in association with Greenpoint Williamsburg Youth Soccer League. The following tennis programs are run in association with Greenpoint Williamsburg Youth Soccer League. The following basketball programs are run in association with Greenpoint Williamsburg Youth Soccer League. The following golf programs are run in association with Greenpoint Williamsburg Youth Soccer League. The following multi sports programs are run in association with Greenpoint Williamsburg Youth Soccer League. The following t-ball programs are run in association with Greenpoint Williamsburg Youth Soccer League. The following lacrosse programs are run in association with Greenpoint Williamsburg Youth Soccer League. The following track & field programs are run in association with Greenpoint Williamsburg Youth Soccer League. The following football programs are run in association with Greenpoint Williamsburg Youth Soccer League. The following cricket programs are run in association with Greenpoint Williamsburg Youth Soccer League. The following field hockey programs are run in association with Greenpoint Williamsburg Youth Soccer League. The following rugby programs are run in association with Greenpoint Williamsburg Youth Soccer League. The following volleyball programs are run in association with Greenpoint Williamsburg Youth Soccer League. 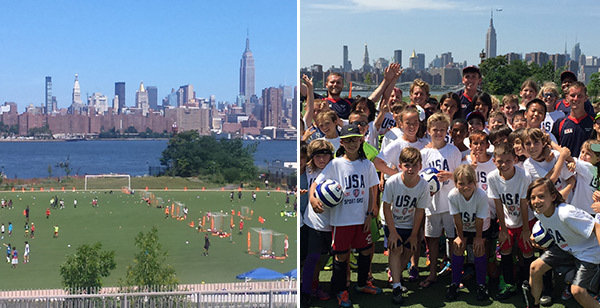 United Soccer Academy is excited to return to Brooklyn for another spring & summer of hosting its renowned soccer camps! Brooklyn soccer camps feature highly qualified international and local coaches who specialize in youth soccer development. Participants will train during the first half of the day, focusing on different skill topics each session. After lunch, players will then compete in small-sided scrimmages for the always exciting World Cup tournament to finish the day. Soccer programs are offered fro all ability levels and range in age from 5-14. To view programs for Greenpoint Williamsburg Youth Soccer League, click the soccer link above. Limited indoor camp spaces available. Rain or shine! Click on soccer link above for available classes. Looking for a fun and exciting option for your child when school is closed? Look no further! United Soccer Academy can provide your child with an excellent soccer camp experience whenever school isn't in session. USA's Soccer Camp is perfect for players of all levels. To ensure that we develop future soccer stars, we group players together based on age and ability. This allows players to experience the excitement of soccer through the concepts of free play, self-expression and creative imagination by competing with players of equal ability. Chess NYC will pick your child up from the field at the end of soccer camp and provide after care until 6pm. Details to follow closer to the summer. For more aftercare information and registration, click here. We have been working hand in hand with the Greenpoint Williamsburg Youth Soccer League for years to run soccer classes and camps for the Brooklyn Community. Our goal is to provide varied and high-quality programming to satisfy the needs of all ages and ability levels. Would you like us to offer additional programming in Brooklyn or have any input into how we could better serve you? Drop us a line and let us know! To register for Greenpoint Williamsburg Youth Soccer League programs, you must contact the organization directly using one of the methods listed below.